Amazon has the TOMSHOO Protection Hip 3D EVA Padded Pants Breathable Lightweight Protective Gear for Ski Skate Snowboard Skating Skiing priced at $22.96. Use code Y3550GIP at checkout and score this for only $14.99 with free shipping. ★Size Chart: ☆L(CN),M(EU)=Waist 26.0-34.6″☆ XL(CN),L(EU)=Waist 26.8-37.0″ ☆XXL(CN),XL(EU)=Waist 28.3-37.8″☆ 3XL(CN),XXL(EU)=Waist 30.0-39.4″. ★Durable and Comfortable: Made of spandex fiber, breathable and durable with great elasticity and malleability. Strong elastic band. Washable, can be washed by hand. Absorbent high quality soft skin-friendly cotton with honeycomb mesh vents for breathability. ★Fasten Tape Design: The front has a fastener tape opening which is covered with a rubber pad, making it well built. Close-fitting, breathable and never sticks to your skin. ★EVA PADS – with strong impact resistance, provide good protection in specified areas including vulnerable hip, thigh and tailbone. 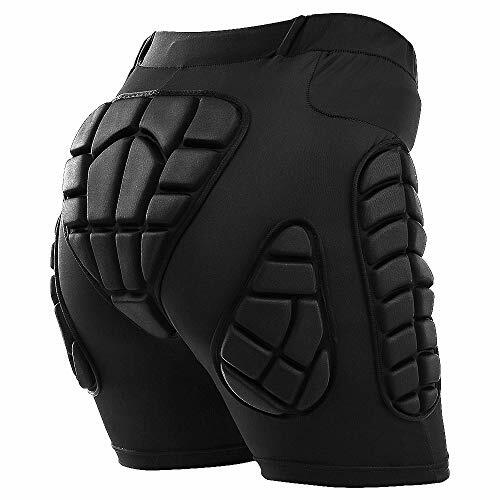 ★Excellent Protective Gear: TOMSHOO ski pants is an outstanding protective gear choice for skiing, inline skating, snowboarding, sledding, BMX/MTB outdoor sports.